Where are my fellow meat lovers at? I grew up with a Dad who cooked a mean steak and we ate them quite often. I then went on to work at popular steakhouse chain restaurant all throughout college and into my early twenties. I actually ended up meeting both my best friend and future husband at said steakhouse. So it is safe to say I know a good bit about steak and it definitely has a special place in my heart. Steak, however, can come with a hefty price tag, especially the good cuts, making it not always budget friendly when feeding a family. 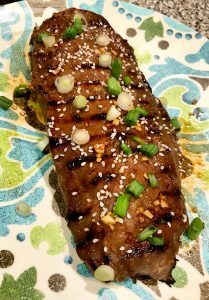 Enter my citrus soy marinade, an easy way to pack a lot of flavor into a more affordable cut of meat. In a shallow glass dish, first zest your lemon, then squeeze in the juice from the lemon, careful to avoid any seeds. To your lemon zest and juice, add sugar, soy sauce, garlic, ginger and one scallion. Whisk until combined, adding a healthy pinch of salt. 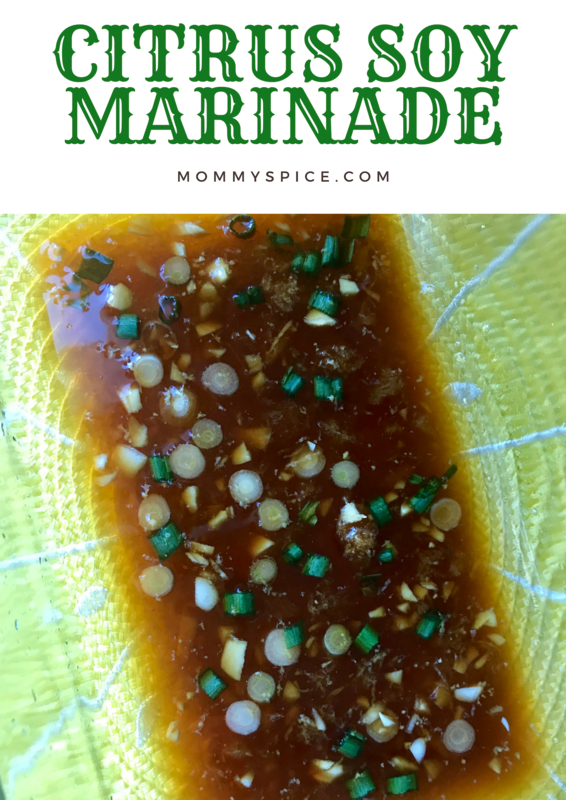 Now remove 2 tablespoons of your marinade and seal in a small Tupperware container for basting when you cook. Then place your reserved marinade into the fridge. Next, place your flank steak into your glass dish, flipping a few times to fully coat in the marinade. Cover your glass dish with a lid or foil and place into the fridge for at least 30 minutes, up to 6 hours. When you’re ready to cook your steak, heat your grill, or a grill pan on the stove to medium high heat. Grill your flank steak 2-3 minutes per side, basting as you go with your remaining marinade. Basting for anyone that doesn’t know, is brushing both sides of your steak with the remaining marinade as you flip your steak during cooking. The best method for cooking steak to your done-ness of liking is by using an instant read thermometer. Everyone’s stove, oven and grill cook differently so exact cook times can be hard, especially with something that overcooks as easily as steak. 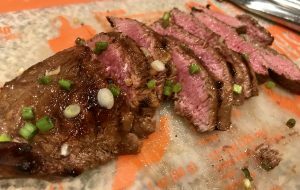 Once your flank steak is done, let it rest under tented foil for 5 minutes, top with remaining sliced scallion and sesame seeds if desired and enjoy warm. This is a really easy way to make steak if you’re new to cooking it. Its Asian flavors are mild enough that you can pair this entree with any sides you like. I’m a meat and potatoes kind of girl, I just love a good baked potato or mashed potatoes with my steaks. However, if you wanted to lean more into the Asian flavors already in the marinade you can make white, brown or fried rice to accompany this. Throw in your favorite vegetables or a side salad and dinner is done! 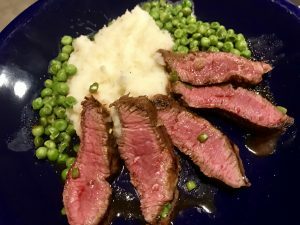 I like using flank steak for a few reasons, one is it cooks super fast, two it doesn’t come with a lot of maintenance, no real marbling or trimming required, and three it’s affordable. 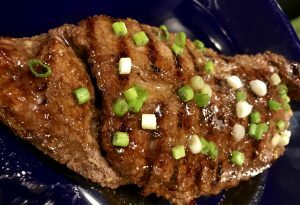 I find using a cheaper cut of meat always helps when I’m making a new recipe, less pressure if I don’t like how it turns out that I didn’t just waste $20 of our grocery budget for the week. That being said though, you can use this marinade on any cut of steak.